The fundamental difference between a thought leader and an influencer is how they use their social presence to make an impact. Online influencers have large followings that they are able to persuade into purchasing a product or service through eye-catching visuals and engaging marketing. The larger their following, the more powerful their influence. Popular travel blogs, for example, are often funded by tourism and destination companies. Influencers receive all-inclusive travel in exchange for positive reviews and recommendations that help drive the companies’ businesses. Influencers are paid to persuade and to be relevant. Thought leaders focus their efforts on acquiring knowledge and being the expert in their niche. They are actively working in their industry to learn and gain experience so they can educate others. While thought leaders have an opportunity for profit, it’s not the priority. 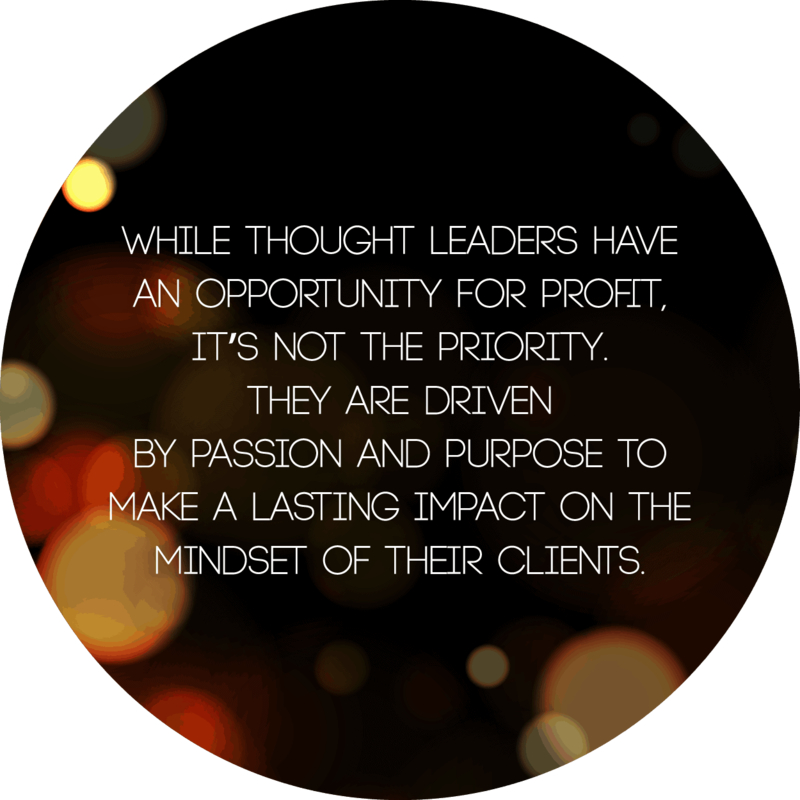 They are driven by passion and purpose to make a lasting impact on the mindset of their clients. I’m familiar with the thought leadership model because it’s one that I’ve successfully applied to Marley Baird Media. 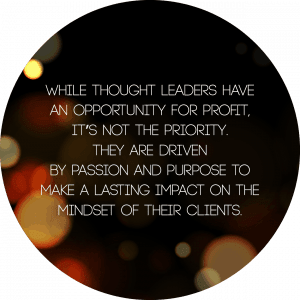 Since shifting my mindset and writing the Thought Leadership Handbook, I’ve attracted the right clients that I love working with who are leaders in their industry. In a digital world where we are heavily inundated with advertisements, conflicting messages, and negative media, it can be challenging to stay focused on our values. With an average of 70,000 thoughts running through our minds that can be influenced by digital noise, we need to be steadfast in what we allow to influence us. In my Thought Leadership Handbook, we call this mindset. Every thought that we allow ourselves to spend time and energy on festers, including the negative ones. Take a moment to reflect on what you let influence you. Are you moving towards your calling? Or are you paralyzed by fear? Are you scared and doing it anyway? Or do you let doubt get in the way? 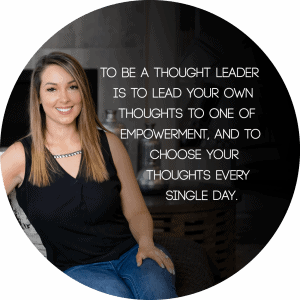 To be a thought leader is to lead your own thoughts to one of empowerment, and to choose your thoughts every single day. what you read, what you eat, right down to who you surround yourself with and whose opinions you let influence your life. This sounds like a lot of intentional work – and it is. 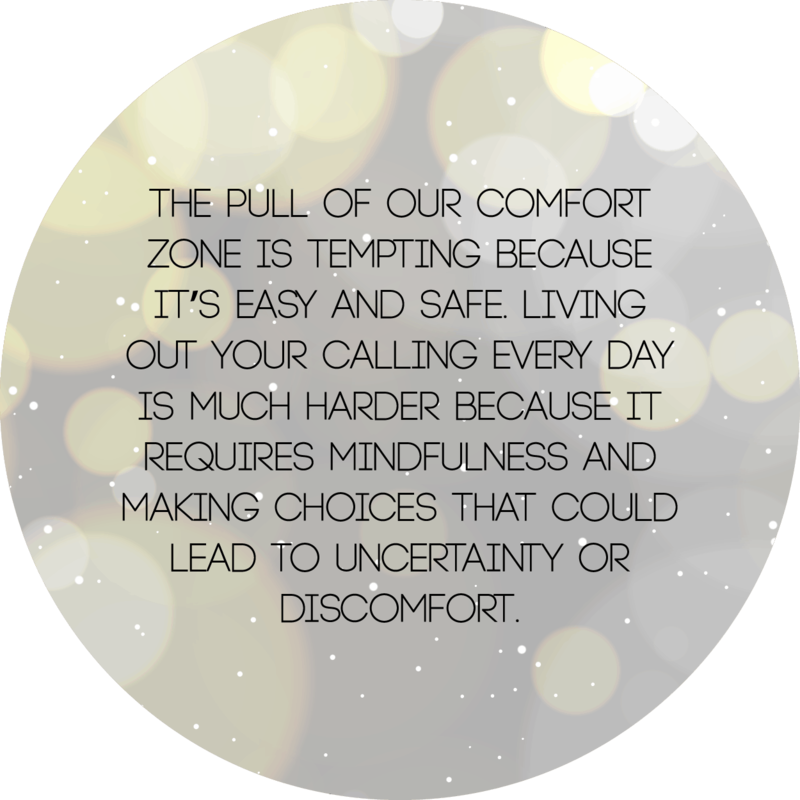 The pull of our comfort zone is tempting because it’s easy and safe. 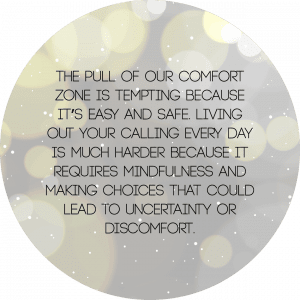 Living out your calling every day is much harder because it requires mindfulness and making choices that could lead to uncertainty or discomfort. However, you wouldn’t be reading this blog if you weren’t ready and curious for a life of purpose. The first step is acknowledging that, yes, you want this and you are ready and willing to do the work to live a life of freedom and joy! There is one more component, the most important tool in my Thought Leadership Handbook, and that is action. Perhaps the biggest difference between a thought leader and those who want to be a thought leader is found in what they do. 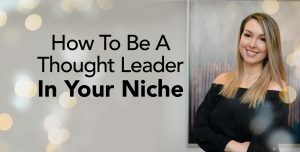 If you want to become the thought leader in your niche, you must understand that becoming is found in the doing. If you wanted to become the best drum player in the world, would you succeed by playing the flute? If you wanted to become the best video producer on the Internet, would you succeed by not producing videos? The secret to becoming a thought leader in your niche is to simply start. Start gaining knowledge, start attending seminars, start spending your time and energy on what will create forward momentum for your mind and for your business. Remember, it doesn’t have to be everyone but someone. It doesn’t have to be everything but something. When you set your mind and keep it set is when you will become unstoppable in every aspect of your life. Are you ready to start? Are you ready to do the work that will create forward momentum? 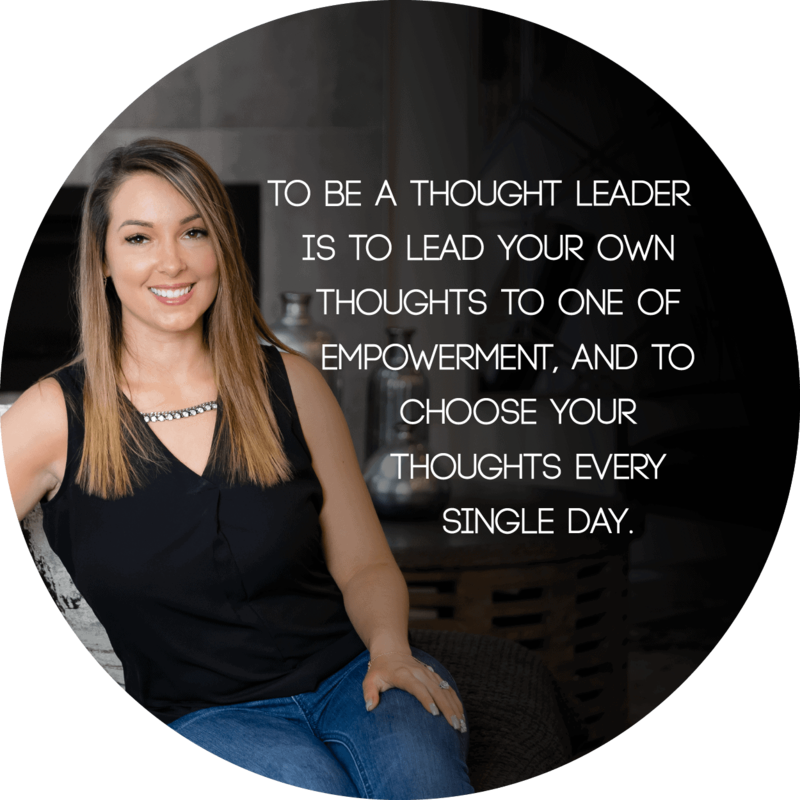 Download my free Thought Leadership Handbook here.